story began after he left a school for the poor in London at the age of 14, and sailed in May, 1784, for Churchill Factory, Hudson’s Bay, to work as an apprentice in the fur trade. Thompson quickly became known to Hudson Bay Company partners for his meticulous work ethic, mathematical skills, and navigational abilities. His thirst for exploration and travel was something they were happy to satisfy, as he traveled all over Canada, recorded the magnetic heading of every stream, did celestial observations to record the exact location of every bend, island, cliff, rapids, falls, and transformed all this information into the best maps of the time. His maps were created on huge paper sheets that would cover entire walls. Plans for establishing forts, trading posts, and seek natural resources were all based on his maps by those both in Canada, the U.S., and back in London. He established the boundary between Canada and the United States. Also, Thompson had traveled more than any other man. 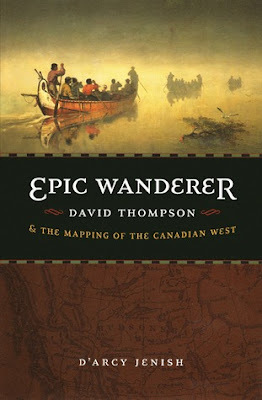 Only three other expeditions had been led to the Pacific, those by Simon Fraser and Alexander Mackenzie in Canada, and Meriwether Lewis and William Clark in the United States, but Thompson had traveling more than any other man, covering over 50,000 miles. He also kept extensive journals on both his work and all of his adventures. This book is taken from those journals, and will give you as precise an understanding of the man and the young and previously unknown country as you will find anywhere.